Greetings and welcome to this April edition of Update. On the verge of springtime in Ohio and looking forward to some traditional holidays this month. Easter is a bit early, with the culmination of the Christian Holy Week, this Sunday, April 1st. And the season of Passover is just ahead. 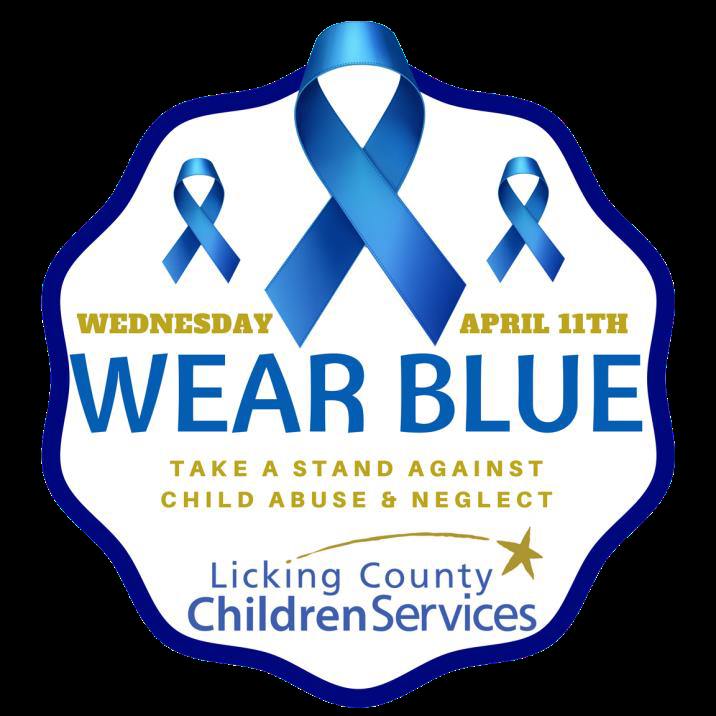 April is Child Abuse and Neglect Awareness month and on April 11th please consider wearing „blue‟. The Courthouse will be blue and white, and many of us will be wearing the blue ribbons in April. Earth Day is celebrated this year on Sunday, April 22nd - a day to focus on the natural world and our environment. Arbor Day in Ohio is celebrated on Friday, April 27th, time to plant the next generation of trees. Also, excitement is building in Granville for the new Wildwood Park playground. Several hundred volunteers are being recruited for the half million dollar project that kicks-off April 16th and concludes the following Sunday. To get in on the action visit the Wildwood Park Face Book page. I can assure you – as always – we at the Commissioner‟s Office are working full time to make development happen and moving our County forward in 2018! A project that began last spring will be completed by this May. The County Government is doing a dual project with the remodeling and updating of it Children Support Enforcement Annex Building at 65 East Main Street and at the same time adding onto the footprint with the County‟s first permanent Records and Archives Center. 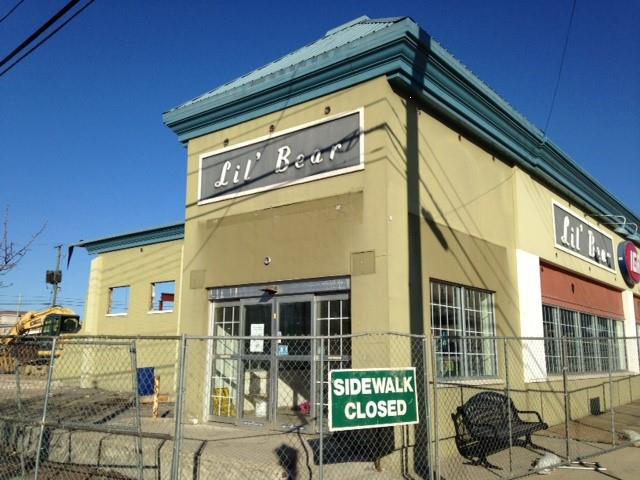 It will have an address of 61 East Main Street. This photo taken at the rear, looking northeast, shows the evolving front entrance to the Records Center. The County saved some $4-million in construction costs by combining these two capital projects into one larger facility on this downtown site. 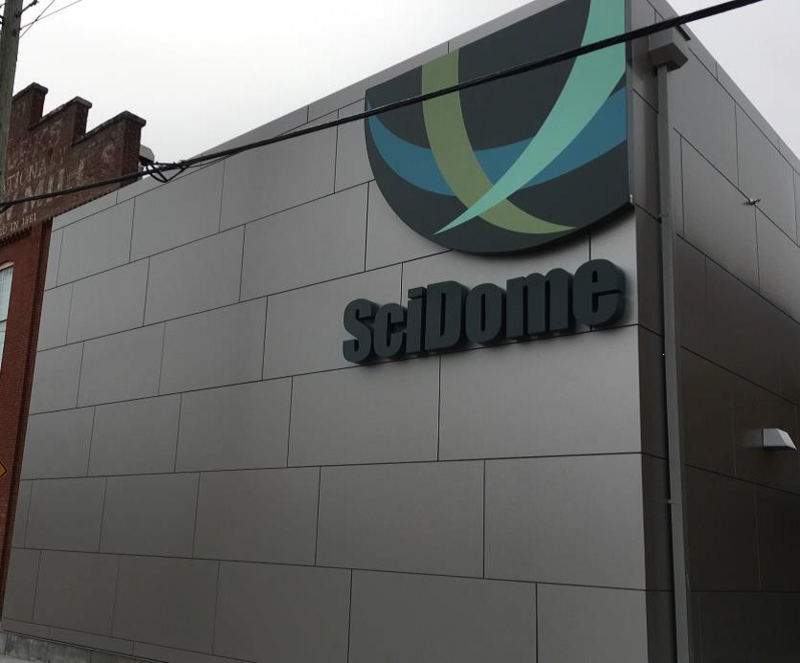 Opening on Saturday, June 9th is this new SciDome is at „The Works‟ at First and Scheidler Streets in downtown. 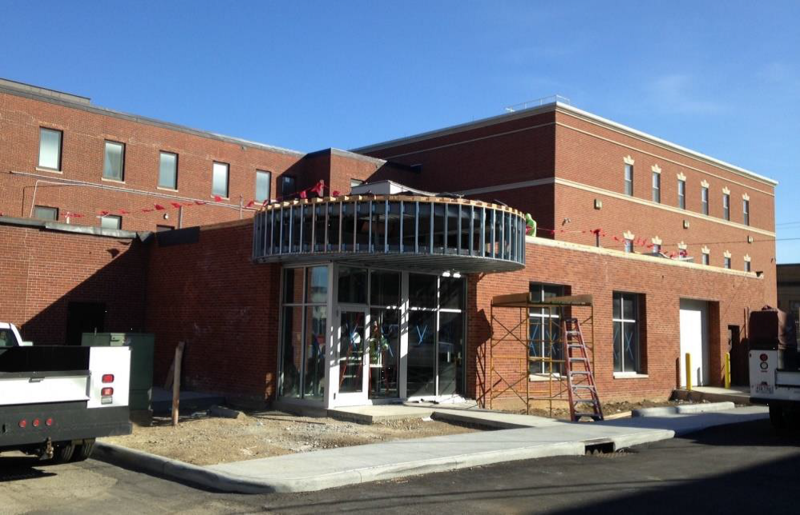 This $2.1-million addition to The Works will feature a planetarium with theatre seating for 60-plus guests. This project is a joint effort by „The Works: Ohio Center for History, Art and Technology‟ and the Ohio State University at Newark. The SciDome will provide a complementary educational component to enhance The Works‟ amazing repertoire of STEM education. The facility features a 30-foot tilted dome with 4K digital and NanoSeam technology for exception ease of viewing and clear projection. The Saturday, June 9th Opening Event is from 9:00 am till Noon for members, and from Noon to 5:00 pm for free public tours. In addition, NASA‟s Voyager traveling display will be parked at the event for tours. 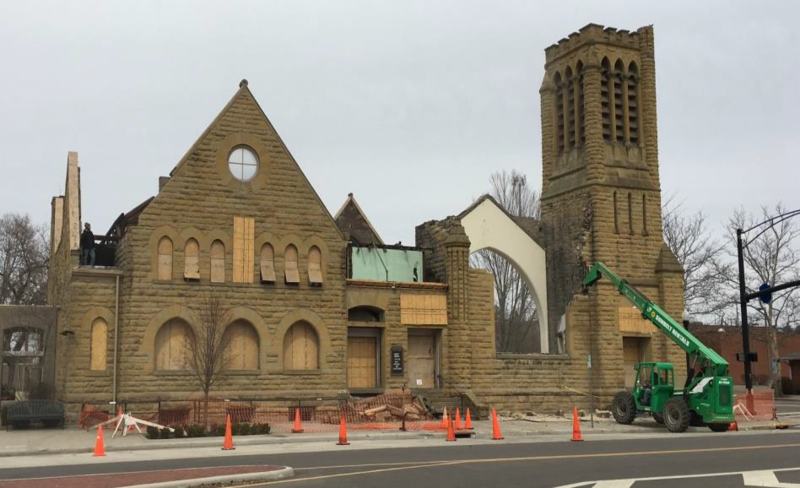 congregation will move forward in their newer adjacent building, with the promise of a new structure on this downtown site in the years ahead. And in Pataskala, the long awaited new police station is under construction by the Robertson Company. The new $4-million facility, opening next year, will be located behind the current City Hall on Broad Street. This new police station will replace the inadequate and aging station in the old City Building in downtown Pataskala. Planning and Organizational Management from Miami University in Oxford. He is also a Certified Planner through the American Institute of Certified Planners (AICP). 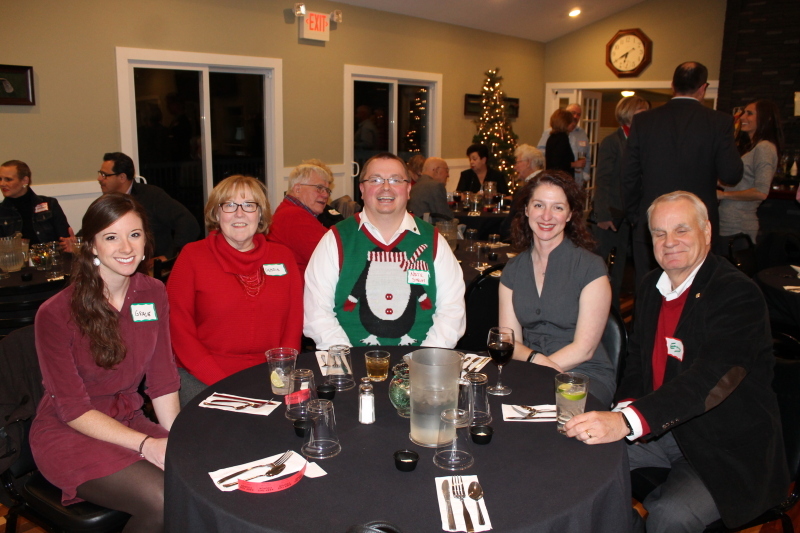 Harkness has been engaged in land use, community planning, transportation projects, grant administration, zoning administration, and economic development capacities for the past 12-years at multiple levels of local government (Township, County, City and the Metropolitan Planning Organization). County Planning Commissioner Chairman Larry Riffe says, “Chris is excited to use his position to serve the community. The challenge is to help steer planning practices, out-of-the-box ideas, common sense reasoning, and prudent stewardship of public resources.” He adds, “Harkness has led transformational changes within the Licking County Planning and Development Department, including reviewing processes and government efficiency”. Heart Chase Event Coming to Downtown Newark on Saturday, May 5th with check-in at 8:30am and the „game play‟ starts at 10:00am. Heart Chase is a national fundraising effort by the American Heart Association (AHA). The Saturday morning event is a team sport that is both educational competitive. The AHA is dedicated to creating healthier lives free of cardiovascular disease and stroke. Teams of from two to five people from dozens of local organizations are participating. 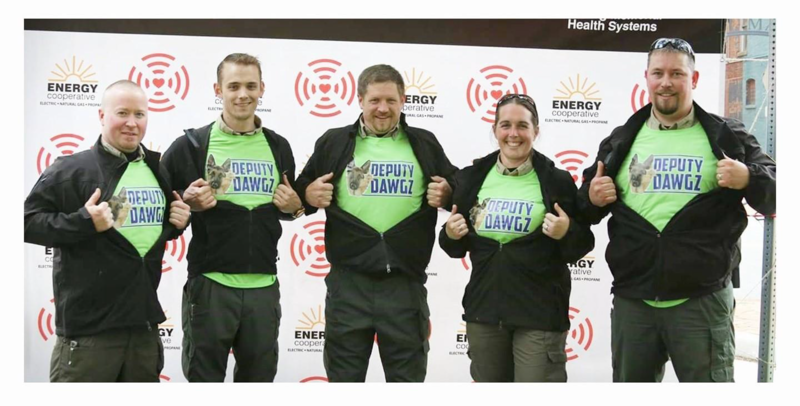 Representing Licking County Government is the team Deputy Dawgz‟ from County‟s Dog Shelter and Adoption Center. The team includes Larry Williams, Tyler Moore, Kris White, Bryant Stough and Carmel Statzer. The two recipients of the “Prosecutors Service Award Top Cop” for February 2018 in Licking County are Sergeant Douglas Wells and Patrolman Michael Trotter. Officer Trotter is currently assigned to the Patrol Bureau of the Newark Police working on midnight shift. 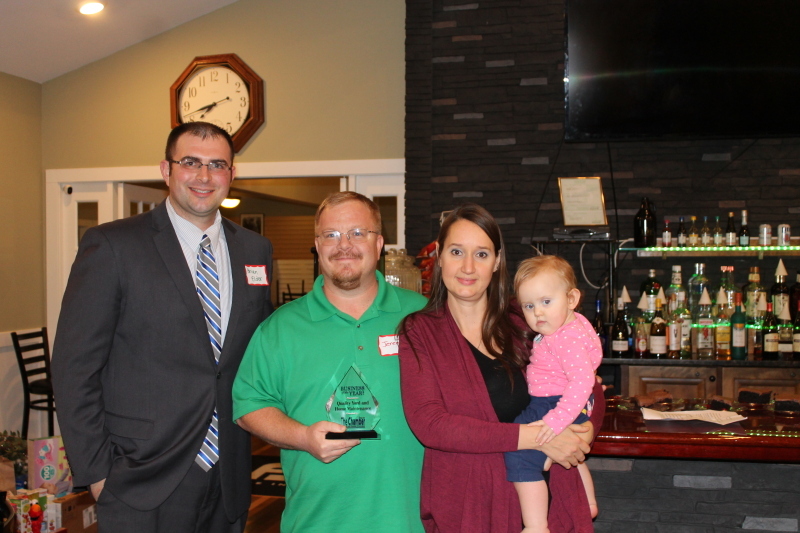 Officer Trotter has also received numerous awards during his time with the Newark Division of Police to include Special Commendation Award in 2003, Meritorious Unit Award 2003, Medal of Merit 2004 Employee of the first quarter 2014 and a letter of appreciation 2014. 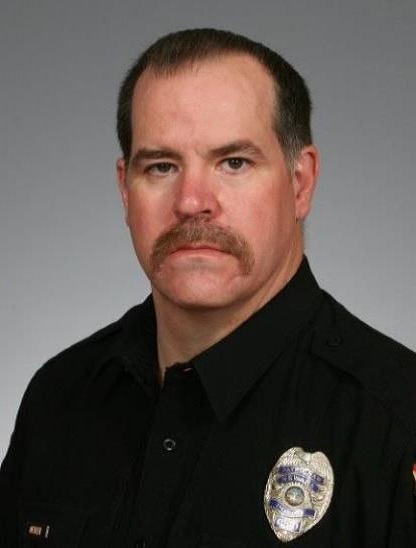 Douglas Wells is an eighteen- year veteran of the Newark Police Department. He has served the department in a variety of capacities over the years. Doug is currently a Sergeant assigned to the patrol bureau. He was named employee of the year in 2009 with the Newark Police Force. Doug lives in Newark with his wife of 16 years, Jenny; and their two children, Gavin and Carmen. development for employers and job seekers, child and adult protective services, and many other services. LCJFS is committed to the accreditation process as it demonstrates the implementation of best practice standards and ensures customers are receiving the best services possible. LCJFS is proud to be an accredited agency, an honor currently bestowed upon only 13 JFS/children services public agencies in the State of Ohio. 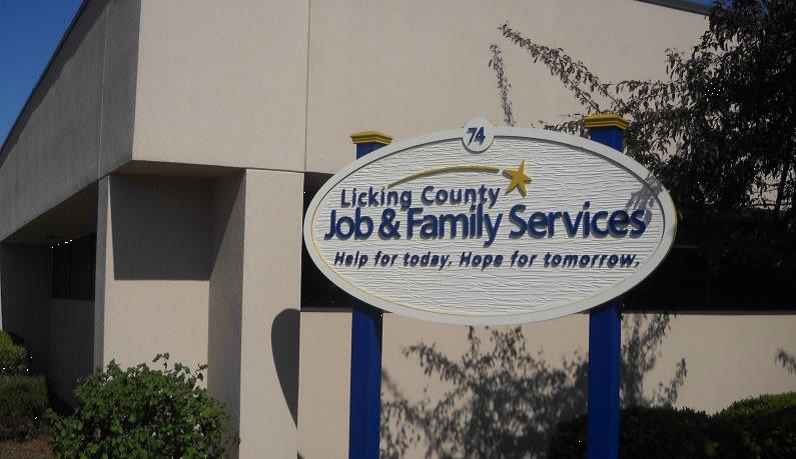 LCJFS is also one of an exceptionally small number of public agencies nationwide who have specific accreditations for their children services, adult protective services, and workforce development functions. Being an accredited agency indicates a commitment to quality of services and a commitment to the clients served by the agency. As part of the accreditation process, COA evaluates all aspects of LCJFS‟s programs, services, management, and operations. COA accreditation is an objective, independent, and reliable validation of agency‟s performance. The process includes a detailed analysis of LCJFS‟s administration, management, and service delivery functions against national and international standards of best practice conducted by a team of independent experts. COA accreditation demonstrates accountability in the management of resources, sets standardized best practice thresholds for service and administration, and increases organizational capacity and accountability. As I mentioned, a couple of months ago, the former Big Bear Store in downtown Newark was being demolished as the building was in deteriorated condition. 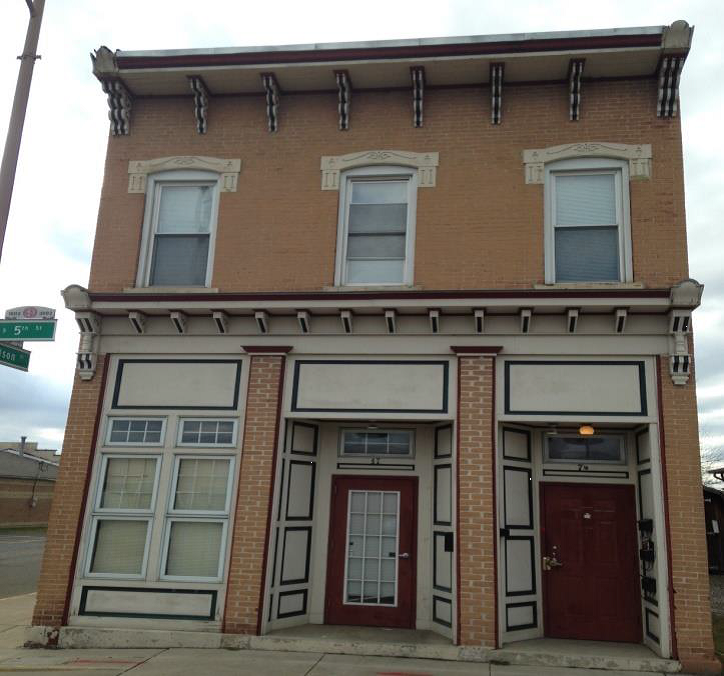 The goal is to clear the South Third Street and make it available for redevelopment. What is interesting is that in the latter part of the 20th century the Big Bear was joined by three other supermarkets in downtown Newark, when it was the retail hub of the area. Maybe before naming the former downtown supermarkets it would be appropriate to look back to how grocery stores in communities such as Newark evolved. I must thank my good friend and Update reader Bill Lavelle, of Newark, for several discussions of Newark grocery history! Taking it back to the 19th century, basically families were much more self-sufficient with large gardens, livestock and local butchering. Bread was baked locally and milk delivered. There were general stores with mostly non-perishable food stocks and of course there were local ice houses to provide ice for your ice-box. It was a different world and not one of convenience. meat and bakeries, and local dairies delivered their product door to door. In downtown the Old Market House stood between Canal and Market Streets, on the site of the new Canal-Market District. 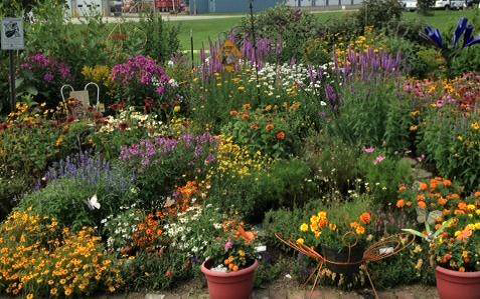 Farmers brought their produce to market and businesses such as Rittenberger Meats (Zanesville), Gus Horst Meats and Otto Steinmeier Meats were featured; and were heavily patronized. Hundreds shopped the Old Market House, especially on Saturdays, when folks „went to town‟ to do shopping! Later in this Update look at the C-M District mural showing the fresh produce. If you were around Newark in the middle of the last century you would remember names like…Murphy‟s Market on West Main Street, Clarence Chenoweth‟s Taylor‟s Groceries on East Main Street, Cy Sawyer‟s Market on East Main Street, „Smilin‟ Gene Campolo‟s Market on West Main Street, Isadore Rothstein‟s Star Market on East Main Street, Lichenstein‟s Fruit Company on West Church Street, Leo Ghiloni‟s Market and so many more. No doubt where you grew up in Newark you remember your neighborhood markets and the folks that ran them. These stores were social gathering points featuring personal service, and even „penny candy counters‟. 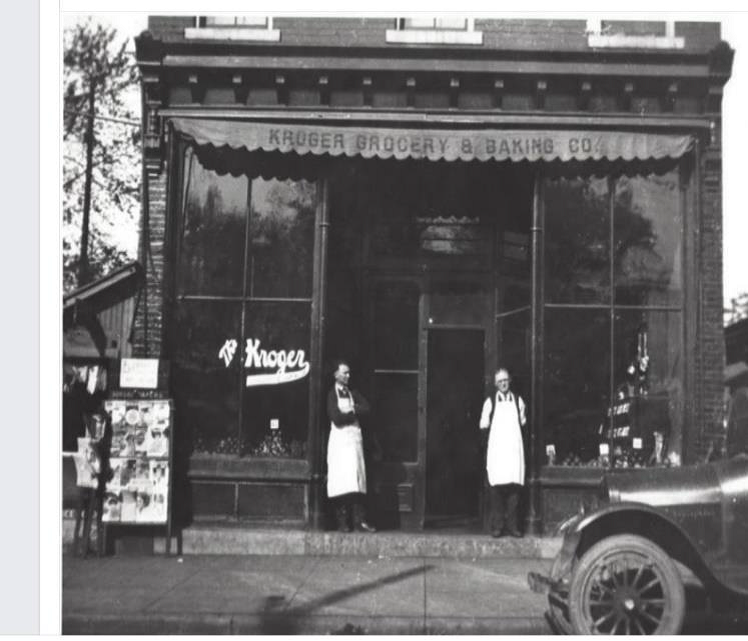 As a quick example think about the stores founded by Barney Kroger in 1883 in Cincinnati. It is now a national chain in some 38-states and still very much a part of our community. Yet, think about this – there is one giant Kroger Store now in Newark (five in the County) – yet in 1940‟s there were „10‟ Kroger stores in Newark. West Main St., 356 Mr. Vernon Rd., 180 East Main St., and 323 East Main Street. The final one to mention was The Kroger Grocery and Baking Company at 47 South Fifth Street, just south of the new public library. (Photos above, a view from a century ago and today). You could probably put all 10 of those early Newark Kroger Stores into the large footprint of the new Kroger Market Place in north Newark. So, when I began this „look back‟ I mentioned that there evolved four large supermarkets in downtown in the middle half of the 20th Century. Do you remember them? items in seperated departments, and the availability of perishable goods. The first „supermarket‟ in downtown was the Krogers at 30 South Second Street (just south of the County Administration Building) and now Mid City Tires. Earler I mentioned Bill Lavelle as a source of great information, and featured here is a photo of Bill recently in front of the former Kroger Supermarket. 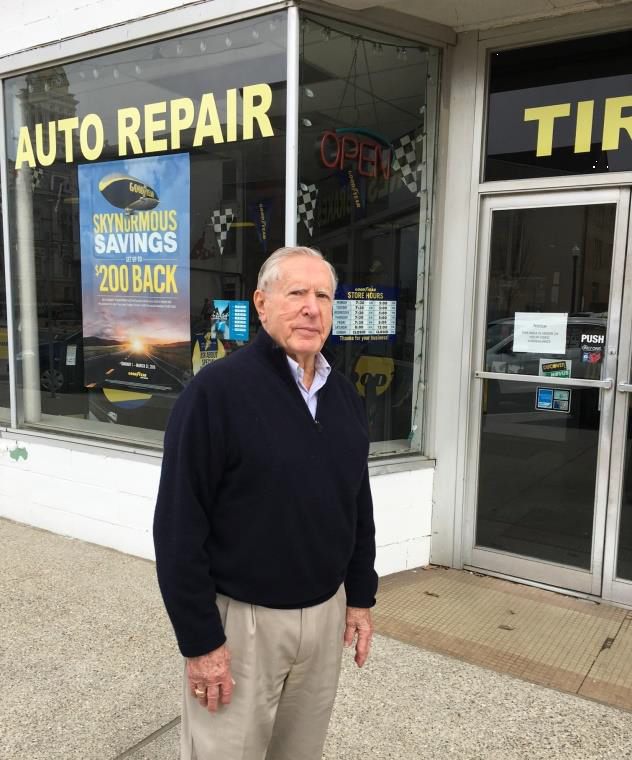 Bill worked there as a teenager starting in 1944 waiting on customers and even running cash registers. He made 43-cents an hour and was paid in cash on Saturdays. He later worked at two of the other local Kroger stores. The other two downtown supermarkets added in the 1950‟s were the Albers Supermarket at Scheidler and South Second Streets, in a building now occupied by the County‟s Department of Job and Family Services. And finally, the A & P Store (remember The Great Atlantic and Pacific Tea Company) on South Fifth Street. 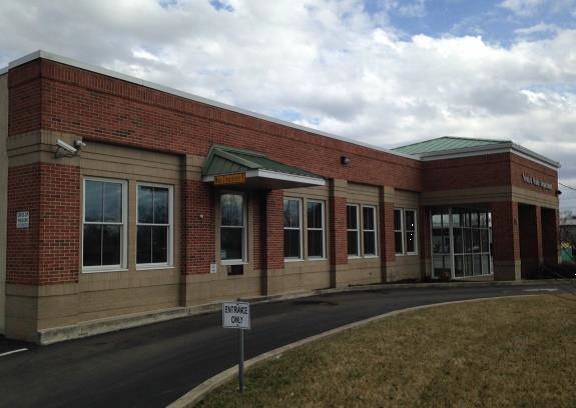 It was in a building now remodeled and housing the Newark City Water and Wastewater Department. This article is a bit longer in terms of information, but I thought you my Update readers would enjoy a bit of Newark history. E-mail me if you enjoyed this – and let me know if you ever collected S & H Green Stamps, Buckeye Stamps, Top Value Stamps, or Plaid Stamps. These were the loyalty and reward programs of the mid 20th Century supermartkets. Judge Robert Hoover has hired Tom Gordon, of Pickerington, to be Administrator of the Licking County Juvenile-Probate Court. 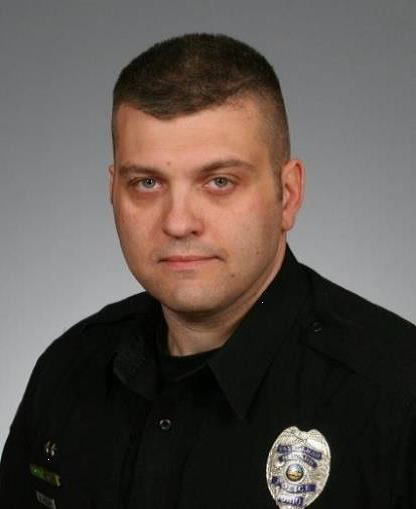 Gordon is an Air Force Veteran and a graduate of the Capital University Law School. He served as an Assistant Franklin County Prosecuting Attorney for three years before entering the private practice of law. 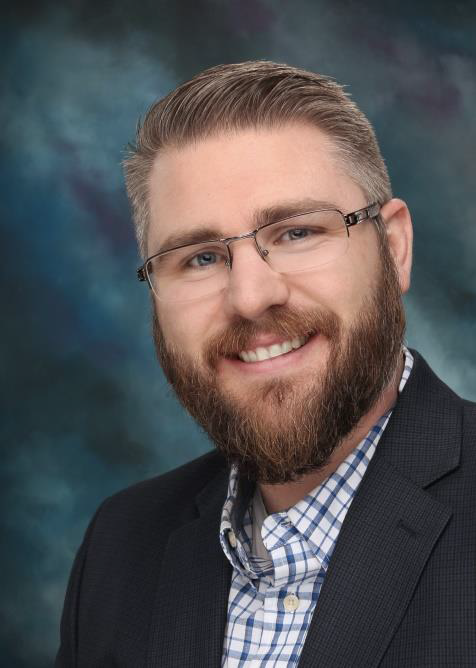 For the last five years, he has been the Managing Partner and Chief Financial Officer for the Gordon, Kaufman & Klein Law Office in Columbus, Ohio. Gordon replaces Dave Edleblute who served in the position for 21-years and recently took a position with the Ohio Supreme Court. Alexandria Mayor Jim Jasper is doing a great job communicating to Village residents in newsletters. As Commissioner I appreciate his efforts to promote good local government and wanted to share a recent article to his community titled “Protect and Serve”. As this several month series on public art with murals, sculptures, statues and paintings – we will focus on a couple of murals in the famous Canal-Market District in downtown Newark, as well as a fun piece on the Bike Trail along the State Route 16 Expressway (aka The Woody English Parkway). 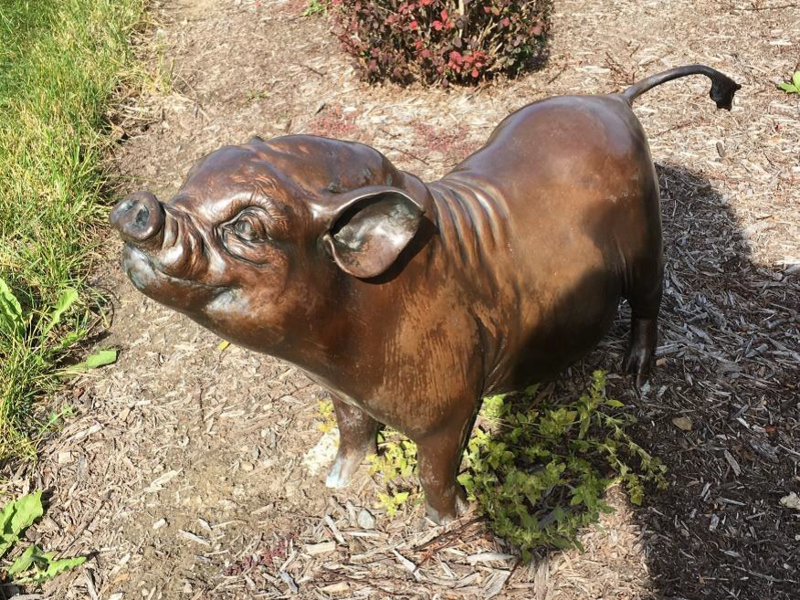 And will conclude with a couple of small animal friends in the center of the Newark Campus of Ohio State University and Central Ohio Technical College. 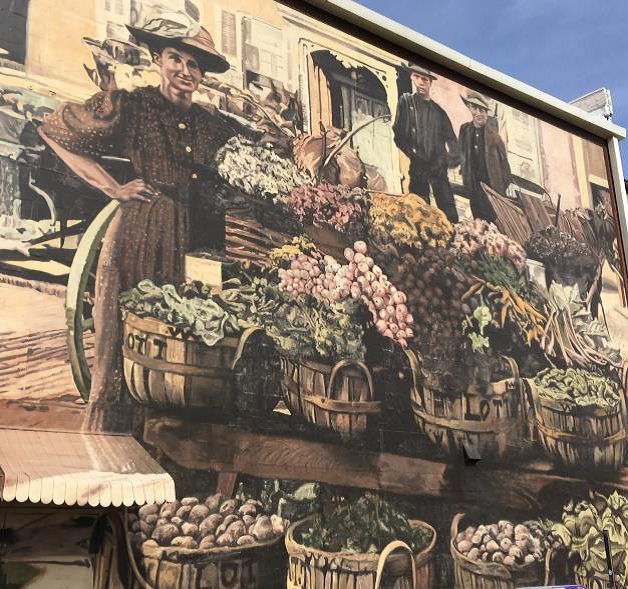 Keep in mind the Canal-Market District‟s weekly Farmer‟s Markets resume in May, and when you visit this area just a block south of the downtown Newark Square, be certain to enjoy the building murals. Seen here is “The Market” which harkens back to the active farmer‟s market and a lady selling fresh produce from her farm locally. The painter/creator is Curtis Goldstein and the location faces Market Street looking south. The donor of this public art was the City of Newark‟s Office of Community Development. 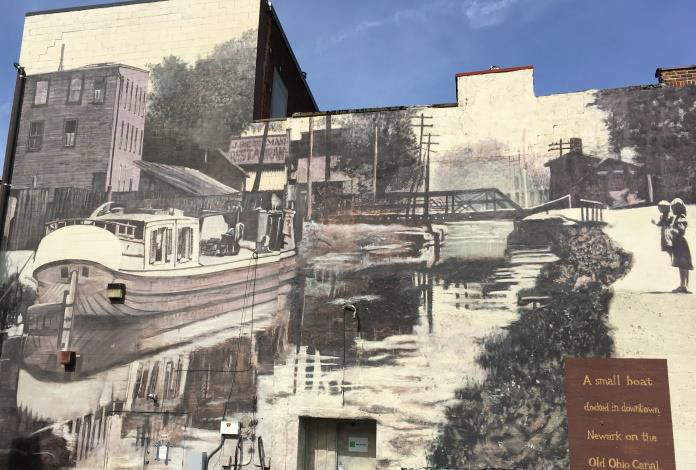 Another Canal Market District (CMD) building mural is “House Boat on the Ohio Canal”. This image was recreated by painter Curtis Goldstein and also faces Market Street overlooking the CMD‟s Gilbert Reese Pavilion. Moving away from downtown and into west Newark, we look at beautiful three dimensional arts. This piece by Sculptor Gary Lee Price is part of the “Family Outing” series along the State Route 16 (Expressway) Bike Path and was donated by The Gilbert Reese Family Foundation. 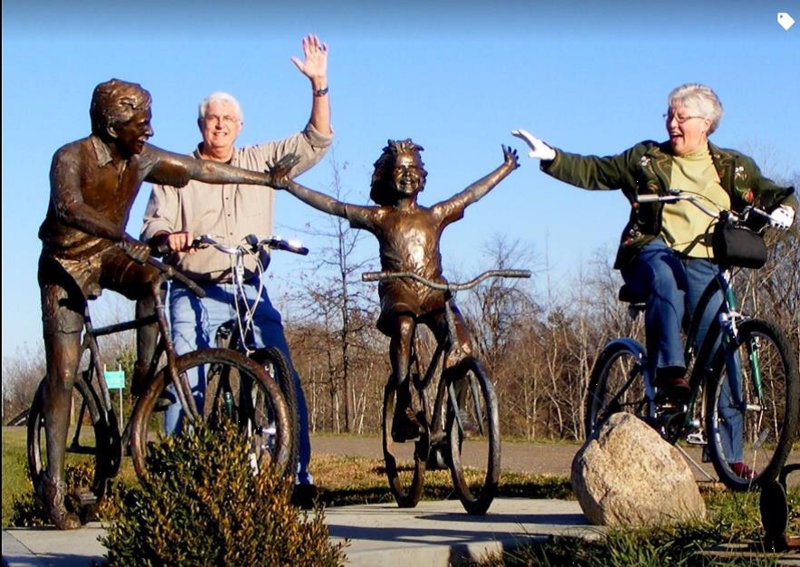 The two „real‟ characters, joining the father and daughter biking, are good friends Bill and Pat Weaver out enjoying a day of biking on the local trail. Rounding out this month we venture to the Newark Campus art collection on the center „campus green‟. “Charlie Black” is a big fella who grunts his way into your heart. 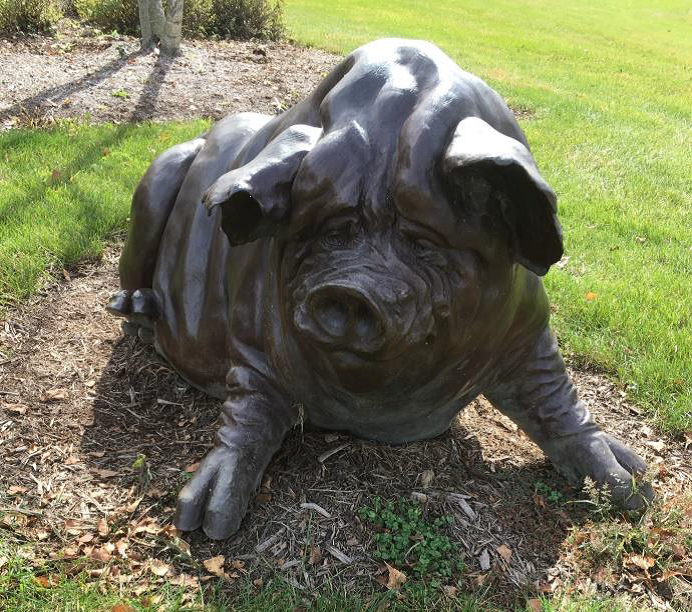 Sculptor Carrie Gantt Quade created this fun work which was donated by the T. J. Evans Foundation. And we conclude with a companion piece at the OSU-Newark COTC Campus, on the center Campus Green. The piece is titled “Charlotte” and was also created by Carrie Gantt Quade. Again thanks to the Trustees of the Thomas J. Evans Foundation for this gift of public art to the community! This series on public art in Licking County will continue next month. I hope you enjoy the work. And feel free to e-mail suggestions from throughout the County so I don‟t miss any of the pieces of public art. The Locally Grown and Gathered Dinner will be Friday, April 27th at The Reese Center on the OSU/COTC Campus. Central Ohio Technical College (COTC) Culinary Science Technology students, led by Chef Matt Russo, in partnership with the Licking County Soil & Water Conservation District, are excited to host the Locally Grown & Gathered Dinner as a fundraiser for the Hartford Fair Natural Resource Area. The Natural Resources Area provides fun, free and educational programs related to the wise use of our natural resources. Also, Soil & Water is searching for an Agriculture Conservation Technician. The position will coordinate and provide assistance for agriculture conservation practices under NRCS (Natural Resources Conservation Service) guidelines. Deadline to apply is April 16th. years and older) $10.00, and students $5.00. 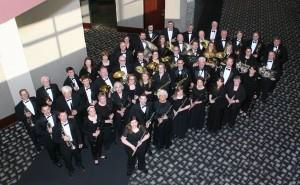 The Evening at the Pops begins at 7:30pm. One of my Update readers, Robin Lyn Green, ask me to share information regarding „parking lot‟ services offered at her church, Saint John‟s United Church of Christ at 285 West National Drive in South Newark. 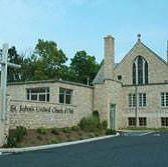 Glad to share the „good news‟…The Outdoor Drive-In Service at St. John’s United Church of Christ occurs (on Sundays) April 8th through October 7th at 8:00am. Come as you are and stay in your car, tune your car radio to 98.9 and hear the service over your car radio. People enjoy this service for many reasons, it’s earlier, it’s great for relatives that have difficulty getting in and out of the car and for those visiting or maybe camping in the area and don’t feel they have “church” clothes with them. A FREE series on Vegetable Gardening is being offered through September. The location is the OSU Cooperative Extension Office in the County Ag Building at 771 East Main Street in East Newark. Below is the list of programs – no registration is needed to attend. Swihart.33@OSU.Edu or call her at 740-670-5322.
lettuce in the mid-1870‟s and it has been a gardener‟s favorite ever since. The plant prefers cool weather so as soon as the soil can be worked the seed can be planted because the lettuce can withstand a light frost. It can also be started indoors four weeks before the last frost and then be transplanted into the garden. 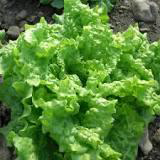 The lettuce is attractive enough to add to flower beds with its light green color and ruffled leaves. In six to seven weeks, you will be able to harvest the larger leaves to add to a salad of mixed greens or perk up your sandwich. The plant provides a clump of loose leaves which can be pinched off at the base and the others left to grow. It does not go to a head. The ancient Greeks had a tale from mythology that influenced their thoughts about lettuce. The Greek goddess Aphrodite known for her beauty fell in love with a mortal named Adonis. She adored his beauty so greatly that she decided to hide him in a bed of lettuce to keep him away from the other goddesses. While hiding there he was attacked by a wild boar and killed. Thus arose the belief among the Greeks that lettuce led to male impotency. Despite that reputation, the Romans valued lettuce as an appetizer and began their meals with a salad believing that it would enhance male sexuality. Today we often serve lettuce at the beginning of the meal without any mythology attached to it. easy to grow and may offer darker green or even red leaves. Lettuce supplies Vitamins A and C along with dietary fiber and very few calories. You won‟t need much space so look around for a place to plant your lettuce. Feel free to forward this e-mail Update in any direction you would like, and let me know the e-mail address of anyone who would like to be included on my Update Newsletter list. Let me close with a final image of public art in Licking County. 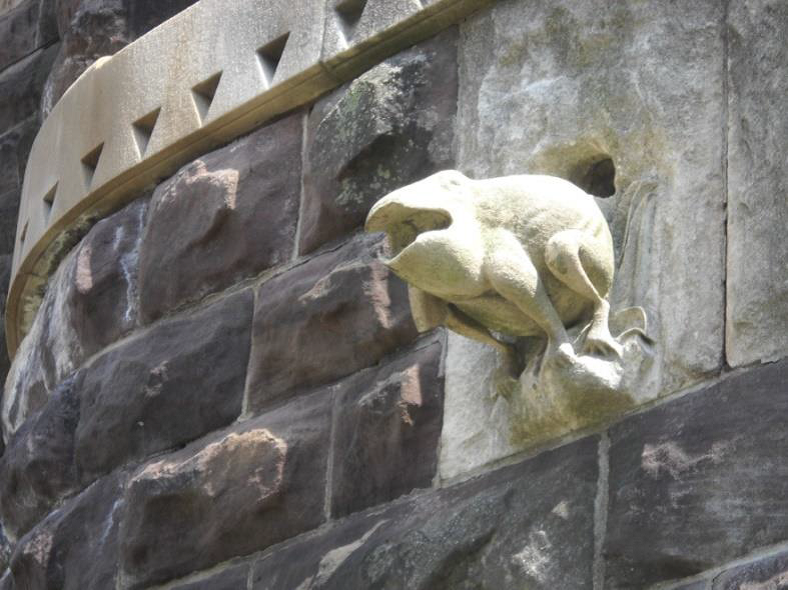 This carved stone frog downspout is one of the many beautiful carved stone pieces on Licking County Historic 1889 Jail in downtown. The artist is unknown. I can also be e-mailed at tbubb@lcounty.com, and my desk phone number at the Commissioner‟s Office is 740-670-5118. 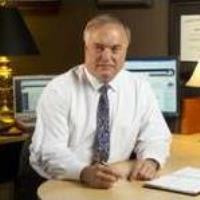 Check out my Commissioner Tim Bubb page on Face Book.